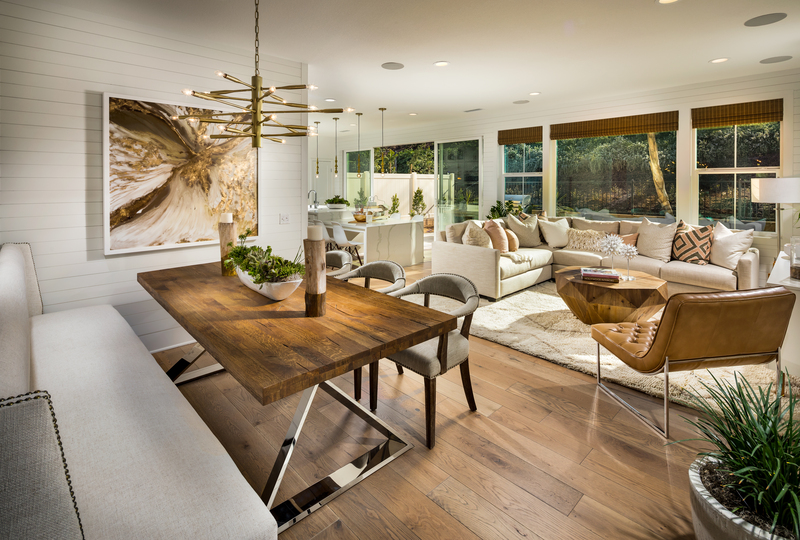 Trumark Homes, the national award-winning California homebuilder, has debuted one of their newest communities, Founders in Chino Hills. The Founders project will have a total of 76 duet style, two story homes by December of 2018, on the land where the city of Chino first built a civic center and library. The Founders site was also the former location of the City Hall, which was fully developed in the late 1980s. The site had been vacant since 2001. The property was then purchased by Trumark Homes from the City of Chino Hills. Trumark then developed a very unique product offering while working with some challenging land use regulations. Already being familiar with the territory, the team was uniquely prepared to deal with some of the challenges that would come with this project. Chino Hills’ unique zoning standards presented a problem when developing detached products. Successfully designed by Woodley Architectural Group, Inc., Founders features duet homes with predominant detached home elements, including traditional orientation to private streets, two-car driveways, backyards, and private living spaces, all without any common walls. This design proved very appealing to their target family buyers; Founders actually outsold the market. 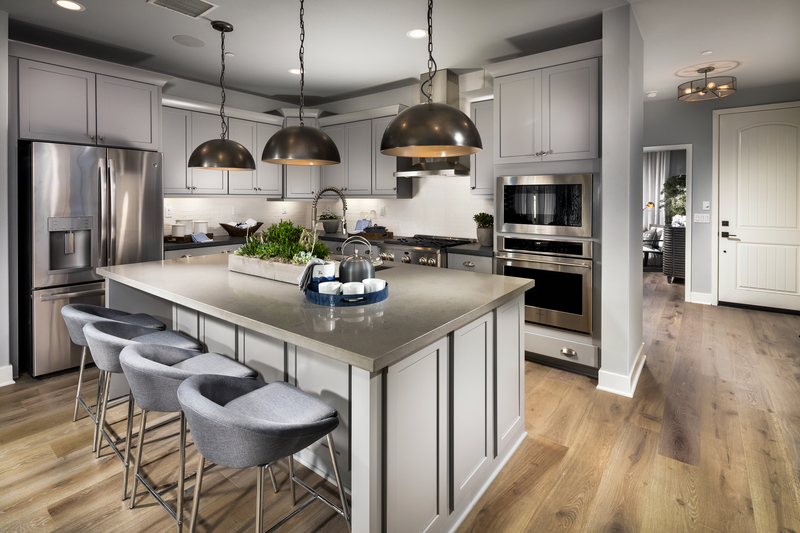 Pre-sales began in September, and there were over 1,000 attendees at their model home grand opening in January which featured food trucks and a DJ. Of the 76 homes, a total of 56 have been sold, 14 of which are closed. With three different floor plans – Franklin, Hamilton and Madison – buyers have a multitude of options available to them. Trumark’s newly debuted TruFlex floor plan is another unique alternative for buyers. Crafted to help the home grow with the buyer, TruFlex is an innovative program for flexible home design. With TruFlex, homeowners can easily upgrade rooms for extended master suites, connect nurseries and exercise rooms, add private bedrooms, and more. This sort of program is incredibly appealing to new families who know they are going to grow. These options are available at the time of construction or can be added by the homeowners at a later date. For example, a large Master Bedroom can be divided to add an additional bedroom and have access to a secondary bathroom. Trumark has framed the homes so that the future door openings are easily accessible beneath the drywall. In line with the California lifestyle, Founders is the first Trumark community where solar panels are required with SunPower solar systems. Homeowners have the choice between buying or leasing solar panels. When purchased, the cost rolls into the home loan and the buyer gets to keep the solar tax credits. When leased, no down payment is required and homeowners receive complimentary installation. Other green features include Rinnai tankless water heaters, Honeywell Wi-Fi programmable thermostats, low-E glass vinyl framed windows, electric vehicle conduits in the garages, 14 SEER high-efficiency A/C condensers, and much more. By knowing their customers and the market, Trumark was able to aptly predict what their buyers would want and is achieving incredible success with this Southern California community. “If the success of our first event at Founders is any indication as to the demand for this type of product in the Chino Hills market, we are confident that the homes within this new community will be quickly swept off the market,” Douglass said. Full build out is aimed to be completed in December of 2018, with a total of 76 duet style homes. Always the multitasker, Trumark Homes just opened townhome models in Ontario and also has a master planned community located in Chino coming 2019.